So many baby things, so little time. It is hard to resist all the adorable things they make for the littlest people, and who can honestly, who past the baby stage can look around and not be jealous of the innovative products they didn't have when their kids were babies? Well, we have a collection of some of these amazing products to share with one lucky mama! 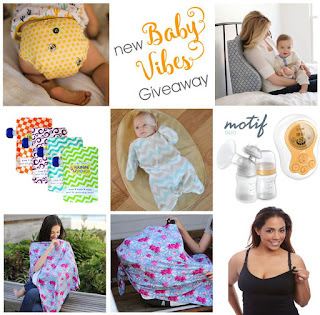 Check out the fabulous products and enter the giveaway below! Buttons Diapers cloth diaper cover + 3 inserts - Buttons Diapers are all-in-two cloth diapers that consist of adjustable waterproof diaper covers and snap-in-place absorbent diaper inserts. Choose a cover and an insert, and you’re set! Winner may choose cover style. BeliBea NOURISH CAMI - For both breastfeeding and hands-free pumping convenience! An innovative dual-panel design allows mothers to keep the garment in place whether breastfeeding, pumping or reveling in the moments between. The inside panel features a unique opening that holds a breast shield in place for hands-free pumping! NOURISH CAMI is a great layering piece and excellent tummy coverage when breastfeeding or pumping! Yummi Pouch Brights (Set of 4) - These reusable food pouches combine style and convenience in an Eco-friendly reusable drink container you can fill with homemade smoothies and blended snacks. Easy to fill and clean through the top zipper opening and simple for kids to drink from the side spout. Back Buddy Deluxe Support Pillow - Award-winning Back Buddy Support Pillow now with an ultra-plush minky cover. All-In-One covers are not removable and may be spot cleaned as necessary. Available in several high-quality colors and designs. Cozy Baby Sleeper by Revelae Kids - Keep baby cozy and secure in this enclosed baby sleeper that provides a baby with cozy boundaries without restricting movement. The sleeper unzips from the bottom up for easy diaper changes and the enclosed sleeper design helps with startle reflex and even discourages a baby from sucking their fingers or thumb. Motif Duo Breast Pump - The Motif Duo is adaptable to meet your individual needs, no matter where you are in your breastfeeding journey. The single or double pumping option allows you to pump how you want, the memory feature saves your settings, and the lightweight portable design makes this pump ideal to take anywhere you go. Milkmaid Goods Nursing Poncho - A nursing cover has never been so functional! These Full Coverage Nursing Ponchos double as a car seat cover, swaddle, shopping cart cover, & eliminates the need for costly breastfeeding clothing. Any new mom's best tool. Do you see the great innovation, making mom-life easier all the time! Good luck to all those who entered!